So here’s a problem that’s not going away: Even if Obamacare worked perfectly, most of the people it's supposed to help wouldn't know how to begin using it. 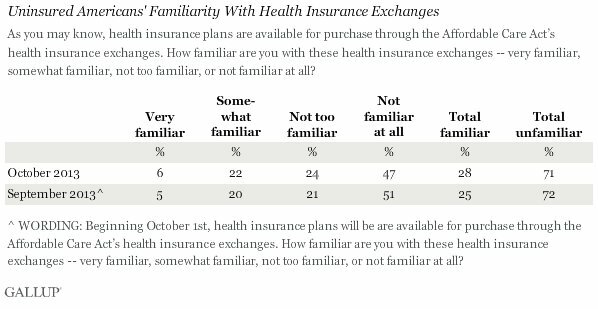 Seventy-one percent of America’s uninsured are still either "not too familiar" or "not familiar at all" with the Affordable Care Act exchanges that opened on Oct. 1, according to a new Gallup poll. The poll was based on interviews with 702 uninsured Americans between Oct. 7-17. And that's no improvement from the month before, even though Obamacare technically has been open for business since Oct. 1. Gallup asked roughly the same question in September and found that 72 percent of people registered roughly the same level of unfamiliarity. The federal government's glitchy Obamacare exchange, and the better-functioning exchanges operated by some states, have the country’s 48 million uninsured Americans very much in mind. The central task of the sites is to help those who don't get insurance through an employer to easily search available options for the plan that best suits them and to get help paying for it. Oh, and of those who plan on getting insurance, only 49 percent plan to use the exchanges to do so; 15 percent aren’t quite sure how they will; and 36 percent plan to use some other means -- options that include hopping on mom’s plan, getting it through an employer or going straight to the insurance provider itself.